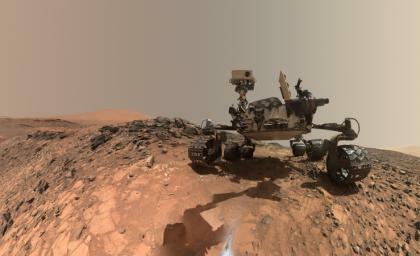 New Findings: The Beginning of the End in the Search for Life on Mars? Preliminary results of new findings by Curiosity, center around a place on Mars called Mount Sharp which has an unusual baseline and basement complex. Of all places to look for life, it may be Mount Sharp with its lacustrine mudstones that has shielded organic compounds. If organic molecules existed on Mars, the scientists thought they would be found there, given that water, thought to be a key element of life, would have flowed there. Specifically, it was thought that, when looking for life on any planetary surface, a lake environment which contained mudstones, (which probably formed 3 billion years ago, plus or minus a few million years), would be the most likely place to look for life in its earliest stage. Nevertheless, the rover had to drill down to get the best readings. The result soon became clear after careful analysis by scientists at Goddard and other branches of NASA who now have conclusively asserted that they have found major organic building blocks of life on Mars through analysis of thiophenic, aromatic, and aliphatic organic compounds. These results were reported Thursday (June 7) in the Ars Technia news release (by Eric Berger) and in a new paper in Science which cites Jennifer Eigenbrode as the lead author for the team making the new discovery. She, like her colleagues, is intrigued by the implications for life in the discovery of sulfur within the organic molecules, which probably helps explain how the organic molecules were preserved near the surface of Mars for a long period of time despite the tremendous winds and harsh radiation. Sulfur deposits are a clue to a larger range of biogeochemical life forms and can serve as evolutionary trigger mechanisms. With this analysis published in one of the leading prestigious scientific journals, planetary scientists, exo-biologists and astro-biologists searching for new discoveries in evolution as indications of past life on Mars and beyond, and in investigating through new tests using the Curiosity and other rovers, are really pushing the envelope. Added results by future missions from the European Space Commission and China could indicate parallel evolutionary processes that would suggest that other evolutionary possibilities are crucial for our understanding of our “human earthling” place in the evolutionary ladder of the inner planets of our Solar system. The excitement over the finding of the building blocks of life on Mars is that it can lead to the discovery of microbial life and other life forms scattered throughout the solar system and ultimately the galaxy. This reminds one of more far-reaching possibilities of co-evolution between Mars and Earth in a much earlier planetary environment. In 1976 one of the authors of this article (J.J. Hurtak) had the opportunity to discuss other evolutionary possibilities on Mars with the renowned planetary scientist overseeing much of the Mars Viking Mission, Dr. Harold Masursky [3,4]. The discussion centered on the possibility of redirecting the Viking Orbiter’s cameras directly on the huge pyramidal land-forms in the Elysium Quadrangle of Mars while passing over the red planet. This, according to the author, would be an ideal place to search for the evolutionary clues of early life on Mars. This suggestion was tendered to Masursky while visiting JPL (Jet Propulsion Lab) as Martian images had shown a precise series of major and minor gigantic pyramids in mathematical arrangement [5,6]. Indeed, planetary scientists like the late French scientist, Jacques Monod, know that Mother Earth does not work through free-standing geometric forms that are straight and repeatable in the greater pattern. Masursky at that time and, later, when he was stationed as a researcher in Flagstaff, Arizona, stated to Hurtak that these forms can be explained by the super-sonic winds that blow across the surface of Mars. The quest is now on to see beyond the frontier exploration using Gas Chromatographs, Quadrupole Mass Spectrometers, and Tunable Laser Spectrometers, for the real story of multiple Life forms (Panspermia) on our sister planets that can be seen in the chemical building blocks of evolution wherever one points the telescope. A new page for a new evolutionary text book is finally here and disclosure is underway! Levin, G.V. and Siraut, P.A., (1976) “Viking Label Release Biology Experiment: Interim Results’, Science (194, 1322). Masursky, H. and Carbill, N.L, (1976) “Search for the Viking 2 Landing Site” Science (194,62). Masursky, H. and Carbill, N.L., (1976) “The Viking Landing Sites: Selection and Certification,’ Science (193, 809). Hurtak, J.J. (1973) The Book of Knowledge: The Keys of Enoch. Los Gatos: The Academy For Future Science. Hurtak, J.J. (1976) “Pyramidal Structures on mars: Do they Hold the Key of Man’s Existence,” Psychic Times, Vol 4., No 2., pp. 1, 15. Berkeley, CA.